"Good for a business hotel." Have a question for Pullman Bangkok King Power Hotel? "This hotel is sooo super great, my mom and my brother love this hotel very much." "This was the perfect place to indulge ourselves for our girls weekend away." "Will definitely come back again!" "The hotel itself is fantastic." 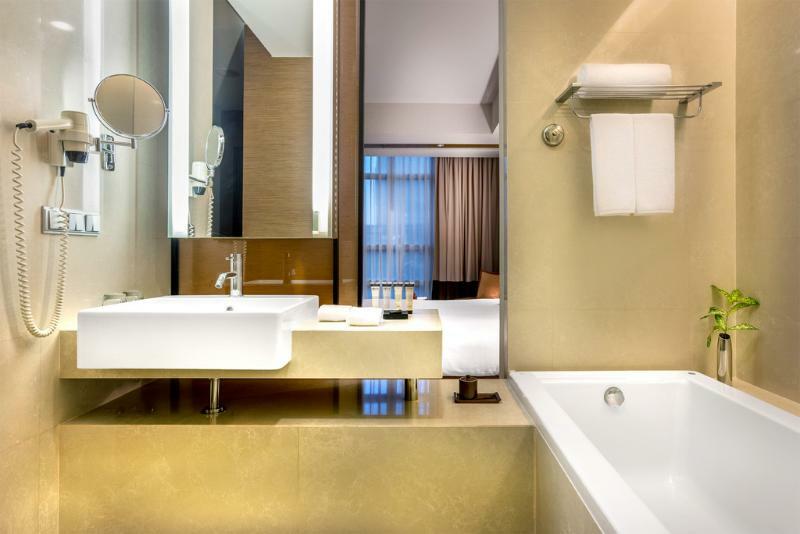 Stay at the Pullman Bangkok King Power Hotel and treat yourself to a lavish and unforgettable holiday. With a 5 star rating, this hotel is great for experiencing a truly luxurious vacation. It has garden and city views to offer guests, so you are bound to be peering out at amazing scenery. 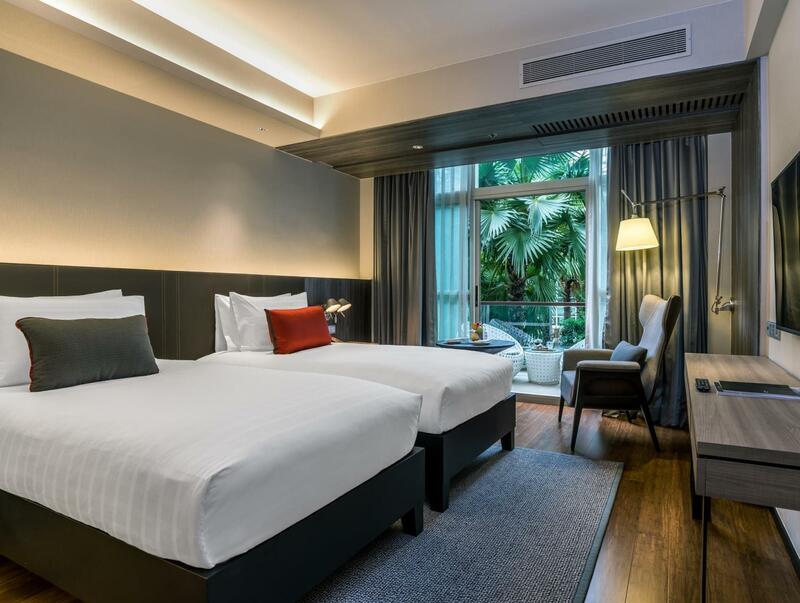 The Pullman Bangkok King Power Hotel is near King Power Complex, King Power Duty Free Complex, Suan Pakkad Palace, Wang Suan Phakkat Palace, and Sriayudhya School. 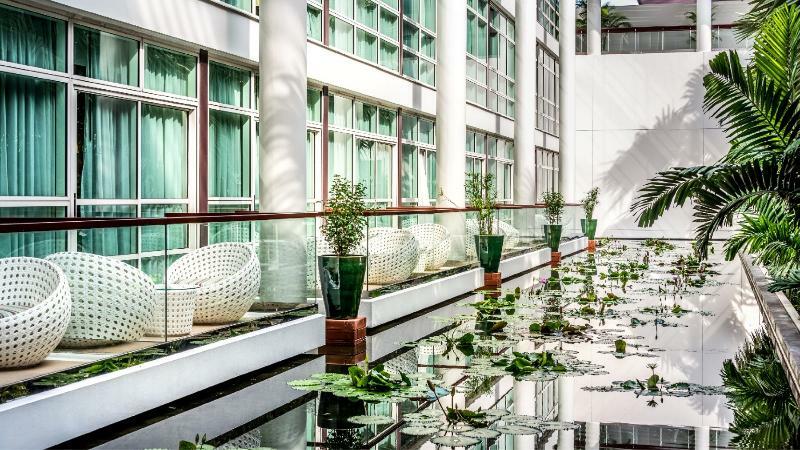 The Pullman Bangkok King Power Hotel features a bar, a poolside bar, room service, a coffee shop, and restaurants on-site, so there is a selection of dining and snacking choices for you to enjoy. This Bangkok hotel offers access to horseback riding, so you can experience an equine adventure. With guided tours available, it is a great spot to stay to learn about the area and see everything you can while you're here. If you want to spend your day simply relaxing and unwinding, you can visit the nearby massage facilities. 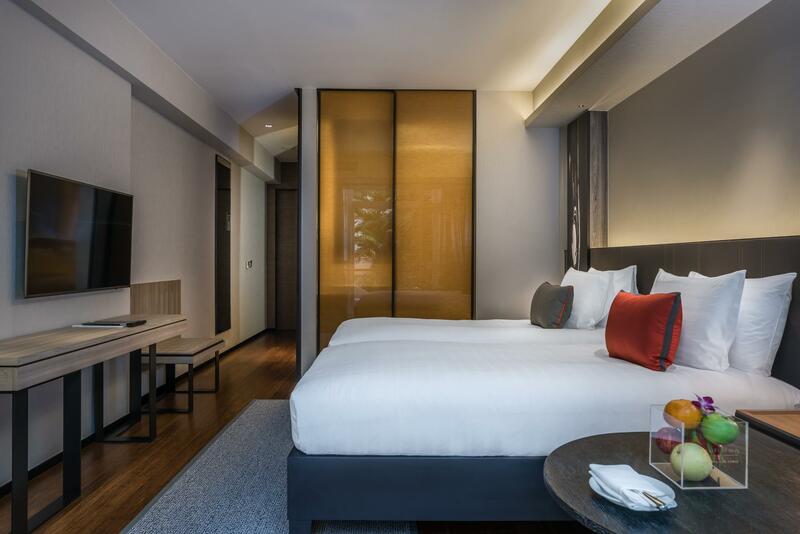 The Pullman Bangkok King Power Hotel has a fitness center, a nightclub, an outdoor swimming pool, a garden, and a sauna among other amazing facilities. This hotel has numerous convenient features, such as an infirmary, safety deposit boxes, a currency exchange, a laundromat, as well as a salon. It features a kids club, offering parents a fun-filled and safe childcare resource. 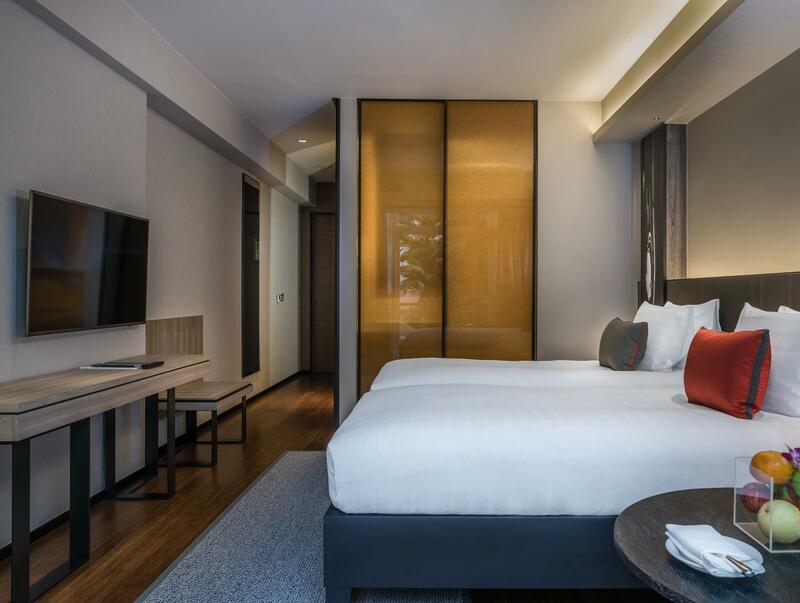 With family rooms, the Pullman Bangkok King Power Hotel has ample space to hang out together. Also equipped with a kids swimming pool, it is ideal for kids of all ages. There's free Wi-Fi in all rooms, as well as Wi-Fi in common areas, allowing you to stay connected to your loved ones without splashing out on data and roaming costs. 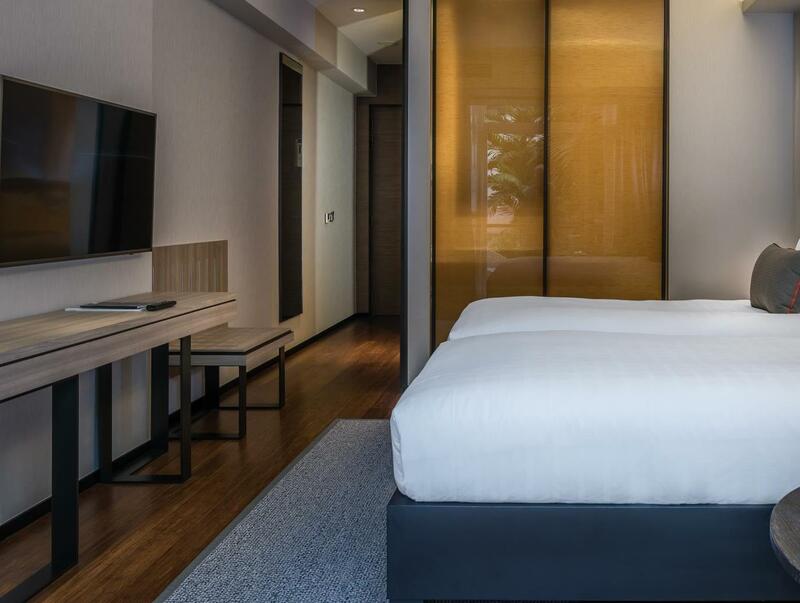 The Pullman Bangkok King Power Hotel offers a number of useful services, which include dry cleaning services, luggage storage, a concierge, a babysitting service, and daily housekeeping. 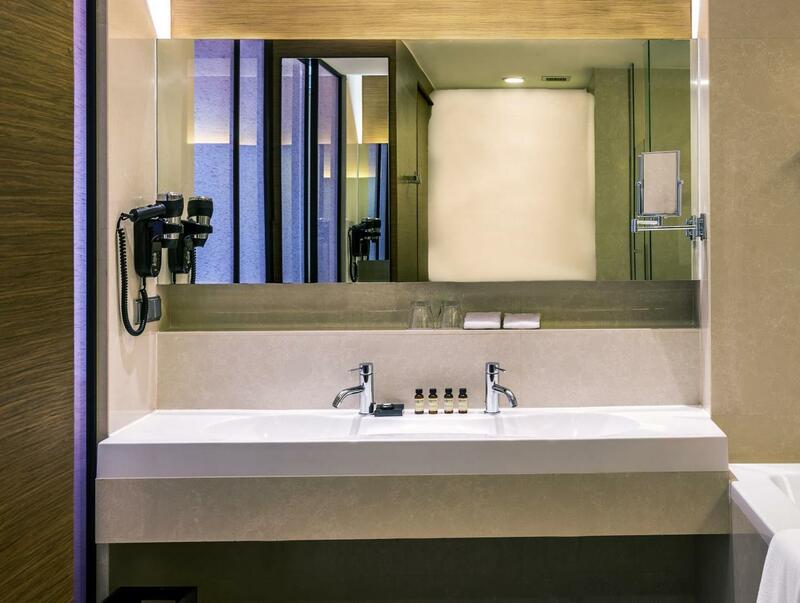 All of the rooms come with a bathtub, a shower, a TV, a desk, and towels. This Bangkok hotel permits pets, so you don't have to worry about finding someone to look after your pet while you're on vacation. The front desk is open around the clock, so there will always be a member of staff behind the desk to help with any questions that you have. The staff speaks English, Mandarin, Thai, Cantonese, French, and more. This hotel has various transportation options including airport transfers, car rentals, shuttle services, and taxi services. Great hotel with an amazing decor and breakfast, however the service at the main bar was shockingly bad! We decided to have a drink at the hotel after dinner. There were five members of staff at the bar (not doing much) and about three tables with customers. I stood up at the bar over 20 minutes to be served and although they all saw I was waiting to be served, not a single one of them acknowledged me. One of the barmen walked over next to me to attend someone who arrived at the bar and when I mentioned that I had been waiting for 20 mins they just handed over a menu without even apologising. I did ask for a couple of beers and instead of serving me, he decided to walk off and ask someone else to serve me which resulted in another 10 mins wait. Not the kind of service you would expect in a 5 star hotel! Great staff and best breakfast ever. Blown away by the lobby and pool area. Room was very nice and tidy - just a little lacking in the finishing touches (have to be picky!) Very nice hotel to stay in for a couple days. Highly recommended. This was the perfect place to indulge ourselves for our girls weekend away. Everything was very comfortable and managed to destress by stuffing ourselves with scrumptious breakfast and lying by the pool. Will definitely come back again! The hotel is not the most accessible on foot, especially with luggage. Best arrive using a taxi or Grab. Hotel also provided discount vouchers for the nearby King Power Duty Free shopping mall, but one has to register with the front desk (located on the ground floor) before able to make use of the discount, or buy anything. Thank you for staying with us and we look forward to welcoming you again soon at Pullman Bangkok King Power Hotel. To be honest, I didn't expect that match about hotel as price is not very high and some negative comments were founded, but that mind was totally changed! Room is clean & quiet, Hospitality is good, Food is tasty... really loved it! Some user comment about Tour-Group are annoying, but it's not much bothered. just suggest for breakfast should go earlier. It was early departure at 5:00, but receptionist kindly prepared breakfast box and Taxi accordingly. It was great stay for my mom's 1st-Time-Visit-Bangkok. 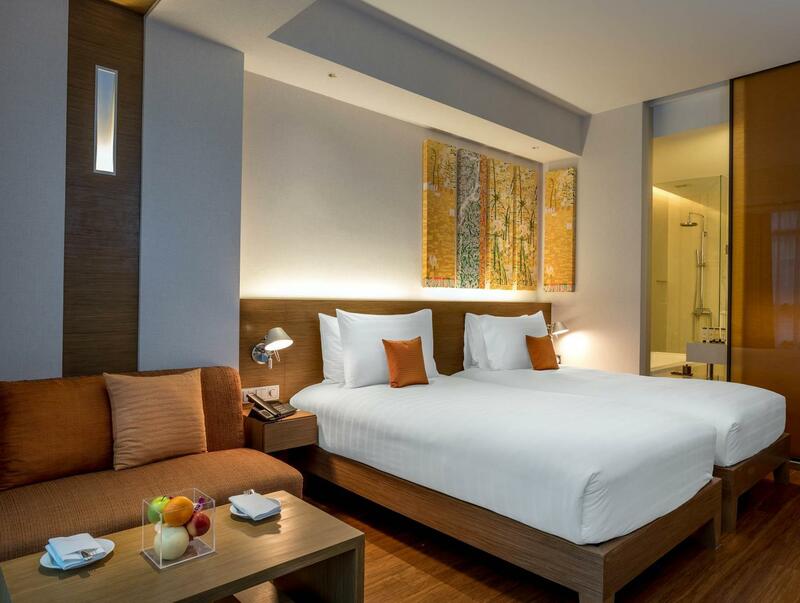 -The is very clean -The hotel location is in the centre of the Bangkok and surrounded by food and shopping centre. - Staffs are very friendly and helpful. The check-in/check-out counter takes long time. If shorter time, it would be much better. Love our stay. Good place for couple. Staff were professional and friendly. Breakfast was awesome. Shopping can be done easily as it is situated next to King Power. Modern hotel, confortable beds, very good linen, any kind of amenities, coffèe machine, kettle, etc... even the weight scale. Extremely professional staff, good wifi. Strategic location, close to shopping area, to bts train (Victory Monument Station) and to airport link station (Phaya Thay). Super breakfast, high quality food. Facilities and room are newly renovated, lobby is especially beautiful. We loved the design of the room particularly the toilet. Quality of breakfast is good. Overall the staff were very friendly and helpful. The pool is nice, but only gripe is that the pool water is always too cold. Location is perfect as we wanted to stay away from Siam/Pratunam area, but it is accessible by a short taxi or BTS ride. We will stay again. Hotel provides tuk tuk shuttle to Victory Monument BTS. I chose this location to be away from the buzz of the Siam area, yet to be convenient to travel via BTS. Hotel room is big and clean and well worth the price. Dear Stella, I appreciate your positive feedback about our hotel. We do take pride in servicing to our guests' needs the best way we can. We are looking forward to having you again as our guest in our hotel. Best regards, Kitiporn/ Welcomer Manager. It only feels like a vacation when the hotel is perfect. King Power met our expectations, breakfast is good (Chinese tour groups are expected, they will show you how to have a good time at the buffet counter). Beds are comfy, rooms are clean but really, the only down side is the tour group. Tip: try to ask for a room that's a different level from the tour group. (imagine waking up to a half naked man walking along the corridor shouting for his bride or something, mothers screaming for their kids to get back, oh gosh it felt like we were staying in a fishing village). We stayed in this hotel many times, it is a great hotel in all different aspects. Love the food from the downstairs restaurant the the facilities. The location is about 500m away from BTS which needs Tuk Tuk as shuttle which may not everyone's preference. Dear Wing, Thank you very much for your comments and for choosing us. I am delighted to know you enjoyed your stay with us. We hope to see you again soon. Best regards, Pannathat / Welcomer Manager. The hotel has modern design especially after renovation. Variety of food for breakfast buffet. Room is clean and comfortable. Good location, just half an hour drive from Don Mueang airport. Much Street food is just near the hotel area. Dear FOK, Thank you for your review and for choosing our hotel. I am glad to know you had enjoyed with our newly designed renovated, variety of breakfast, and good location. We are looking forward to having you again as a guest in our hotel. Best regards, Pannathat / Welcomer Manager. Large and clean room. Tuk tuk to Victory Monument BTS made it convenient - lots of massage places and street food along Rangnam Road. Loved the big swimming pool. Only issue was the shower in the room could not switch from rain shower to normal shower handle. Would recommend and stay here again. Dear Esther, I appreciate your positive feedback about our hotel. We do take pride in servicing to our guests' needs the best way we can. We are looking forward to having you again as our guest in our hotel. Best regards, Pannathat / Welcomer Manager. The staff are genuinely friendly and willing to go out of their way to help. The bed was cozy, the breakfast was great. Lot of green and quiet spaces to relax and unwind within the hotel. Overall a great experience.